North Coast Music worked to get all the details right. 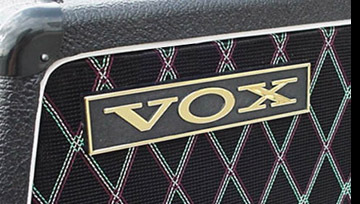 The amp head cabs feature six plastic injection molded vents made especially for this project that are 100% authentic to the originals. 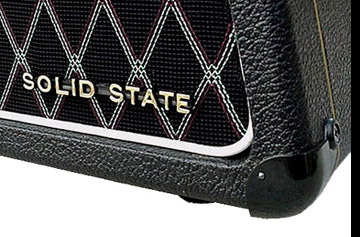 The heads also feature our NCM-030 Vox horizontal nameplate and your choice of either the "solid state" (our part NCM-112) script with gold plated letters or the "Super Reverb Twin" plate (our part NCM-345) with gold letters on the lower right cormer of the front panel. "Original" one pin corners are used throughout. 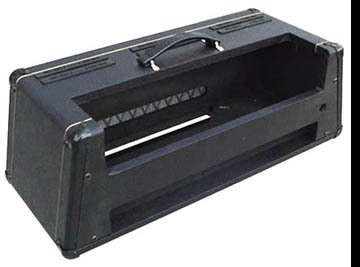 A 1/4" 20 tee nut is installed in the inside bottom of the amp head to receive the wing bolt and "head to trolley" security bracket shown below. 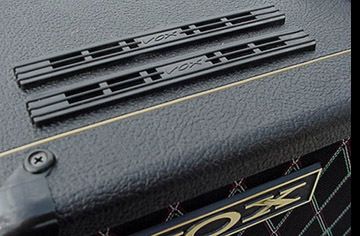 An NCM-103 "Thomas Vox" handle with brass handle loops is also included. Outside dimensions: About 26.7" wide x 10" tall x 10.5" deep including hardware and feet. Inside dimensions: about 24" x 7.5" x 9.5."